For as low as $78 per month with approved credit. Create your own backyard escape with the addition of the Seaspray® Ponderosa GLX model. The pool combines sturdy construction and attractive wall design, creating an inviting aquatic respite for friends and family. With plenty of room for a large pool party or an intimate evening soak for two, the Ponderosa was designed to fulfill all your pool needs. All our PONDROSA pool packages include: 20 mil print bottom lap liner, skimmer and return,an equipment pad, vacuum head, vac hose,cam pole, dip net, brush, and an A-frame ladder. 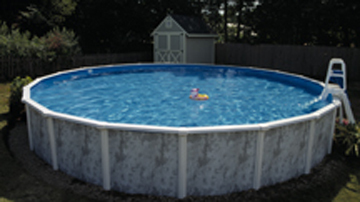 18′ pools include a 150lb sand filter and a 1.5 hp pump by Hayward, 24″ and larger include a 250lb sand filter by Pentair with a 1.5 hp pump.